Principle: Bellows pressure element is works on the principle of Elasticity. Uses : To measure pressure. Bellows is a thin-walled, one piece metallic pressure containing element appearing as a stack of round edged discs. When the pressure inside the bellows increases, these discs thicken and the length of the bellows increases. This increase in length is the sum of the expansion of all the discs and is a measure of the pressure inside the bellows. The movement of the end of the bellows can be used to drive a pointer over a scale. However, in practice the range of pressure needed to fully extend the bellows is very small; so too is the pressure required to strain the bellows. 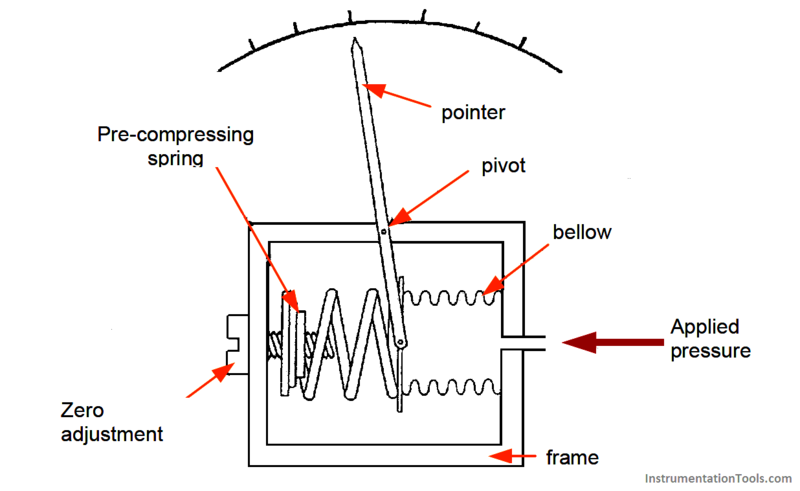 To increase the range of pressure that the bellows can measure, and to protect it from strain, the bellows is pre-compressed and fitted into a bellows unit as shown in figure below. It is used to measure absolute & differential pressure. It is used to measure low or medium pressure rang. Bellows joints can fail catastrophically. No in place maintenance or repair can be performed – they must be replaced if damaged.